Many people when they wake up in the morning after they had a couple of drinks (or more) they experience the well-known hangover (Dizziness, headache, fatigue, severe thirst, even shivering, sweating or nausea). The best way to get rid of a hangover is to stay in bed and try to sleep until the suffering is over. There are cases though that you have to go to work and must find ways to recover from a hangover quickly and effectively. This article provides you with 11 ways on how to get rid of a hangover quickly. According to numerous surveys, the hangover is due to the metabolism of alcohol in our organism and depends on the age and ability of the body’s enzymes to cope with it. About 65% of the people that consume alcohol do experience the hangover symptoms the next day. One of the major differences between drinks is the content of methanol and complex organic molecules. The concentration of these substances is generally high in dark liqueurs, and thus deemed to cause more unpleasant drunkenness. Important role to play in this phenomenon are substances used to fraud drinks, for example the cheap vodka. According to a survey published in the British Medical Journal, the drinks leading to the «worst drunkenness» are brandy, red wine, rum, whiskey, white wine, gin and vodka. Before going out for a drink, a basic rule is not to start with an empty stomach. Food is very important, as it can delay the absorption of alcohol in our body. If you cannot find something to eat, a glass of milk is good enough for a substitute. In any case do not rely on dried fruit or nuts that will bring you to accompany your drink, because nuts will certainly trouble your stomach. Also, before leaving home, make sure that you are properly hydrated. Drink a lot of fluids (no alcohol) because each glass of water or juice you consume before alcohol will prove to be double the next «difficult» morning. Besides that alcohol is a diuretic and therefore you should replace the fluids in your body. Because the best cure is prevention, you should remember the three basic rules to avoid the hangover. First, never drink on an empty stomach. Second, never mix different drinks. Third, prefer special, more expensive spirits to cheap alcohol. Unfortunately, although we are all aware of these tips we tend to forget them the critical moments. If you are reading these post, most probably is too late… Otherwise you wouldn’t have to read them! There are no secret recipes or homemade remedies in order to get rid of a hangover. The best solution is: sleep. Namely, wake up to realize how bad you feel, get out of the bed, drink two large glasses of water, and return back to sleep. Repeat this process as many times as needed during the day. If necessary, inform your boss that you are on a sick leave for the day, which is not very far from the truth. If you are wondering about the above phrase «two large glasses of water», this was done intentionally because we want to emphasize that the main cause of the devastating symptoms of the next day is basically the dehydration caused by the volume of alcohol in the body. 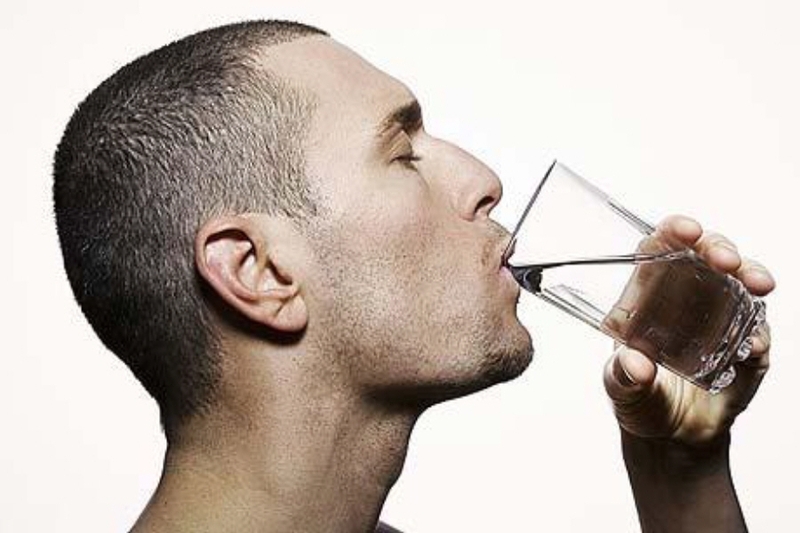 To prevent dehydration, drink plenty of water between drinks-ideal is two glasses of water for every glass of alcohol. To cure and get rid of the hangover drink plenty of water during the day, before feeling really thirsty. The feeling of thirst is in essence, the alarm of our body to notify us that it is dehydrated. It is suggested to drink two large glasses of water before we go to bed, after a night that we have consumed a lot of alcohol. For better results you can accompany your glasses of water with an aspirin that can help you prevent and cure the headache caused from hangover. Also you can take a multivitamin or even better some fresh fruits and vegetables in the morning or before sleep. This will replace the vitamins and minerals that the body has lost and will accelerate the recovery. Particularly beneficial is the tomato juice or orange, which is rich in vitamin B. Do not underestimate the benefits of exercise. As difficult as it seems to you to get up from the couch or go to the gym after work where the only thing you want is to go home to sleep, a gentle exercise will stimulate and help you feel better faster. This is because by exercising and through sweating, toxins that have accumulated in the body are eliminated. Try to walk to the office, if not too far away, or try to walk for 5 or 10 minutes. You can also do some light cycling or some mild exercises at the gym in the afternoon, always taking care to avoid exaggerations and to drink plenty of water. You most probably heard sometimes that a full stomach would help the body to quickly eliminate the accumulated alcohol; this statement is both true and false. It is False if you eat dairy products and also food full of fat. In such a case the results will probably be the opposite, as the mixing of these foods will not help your body to get rid of alcohol toxins. On the contrary, this statement is True if you prefer balanced small meals at regular intervals, rich in fibber and carbohydrates. The tomato is extremely popular among the ‘victims’ of a hangover. A spaghetti sauce with fresh tomato-butter-free may help you to get rid of the hangover faster. Also prefer foods rich in carbohydrates that provide energy, like white bread with honey. Most people believe that a cup of coffee can improve the situation and help you get rid of a hangover quickly. In reality this is another medical myth. Coffee will not help you get rid of a hangover; it is more likely to help in deteriorating the situation. The caffeine stimulates the body, contributing to a temporary increase in the required amount of energy. Theoretically, the same effect is caused by energy drinks, such as Lucozade or Red Bull, which most probably will disturb even more your already disturbed stomach with their carbonate ingredients. The best solution to get rid of a hangover is tea with lemon or without, which brings about the same results with coffee but without worsening dehydration of the body. Again, attention to exaggerations: one to two cups of tea is enough, more would deteriorate the situation as tea has diuretic properties-which is not good for a dehydrated body. If your stomach causes you nausea then to get rid of it you can use an apple or a banana (even better together) stirred in a blender with some ice. This full of vitamins drink may prove to be your «rescue». 9. Get rid of a hangover with alcohol! This method is not proven by any means but some people who have tried it suggest it, and they say it works. Basically what is suggested is to drink an alcohol drink (only ONE) when you wake up in the morning. This is because Alcohol raises blood pressure and it will help you feel better. If you are going to attempt this method, avoid carbonated drinks such as champagne and prefer something milder. Extremely popular for breakfast the next day is Bloody Mary cocktail-vodka, tomato juice, pepper, salt and a little Tabasco. Although you may feel very tired and probably with a headache, a walk in nature and fresh air will make you feel better. This is because the oxygen will stimulate your brain functions that due to the drink will have fallen in «hibernation». Apart body functions, excessive consumption of alcohol harms our skin as well. A dip in the bathtub, after it is filled with hot water and plenty of shower gel, is far better to remove toxins. This is a great post and also has lots of advantage. Thank you because I have recently been searching about for a week and yours this article is the greatest I’ve discovered.